The post It’s A Backlog! appeared first on The Moron Bros Show. The post We Rhyme & We Riff, We Riff & We Rhyme appeared first on The Moron Bros Show. Cj, Keegan, and Tom play dirty silly songs about butts and stuffs but that does not hold back the over all rockingness of the whole show. 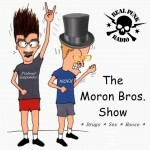 Moron Bros Show #1 – And We’re Back! The post And We’re Back! appeared first on The Moron Bros Show. The post Blog appeared first on The Moron Bros Show.